Measure the time spent in context switch? Long term (job) scheduler – Due to the smaller size of main memory initially all program are stored in secondary memory. When they are stored or loaded in the main memory they are called process. This is the decision of long term scheduler that how many processes will stay in the ready queue. Hence, in simple words, long term scheduler decides the degree of multi-programming of system. Medium term scheduler – Most often, a running process needs I/O operation which doesn’t requires CPU. Hence during the execution of a process when a I/O operation is required then the operating system sends that process from running queue to blocked queue. 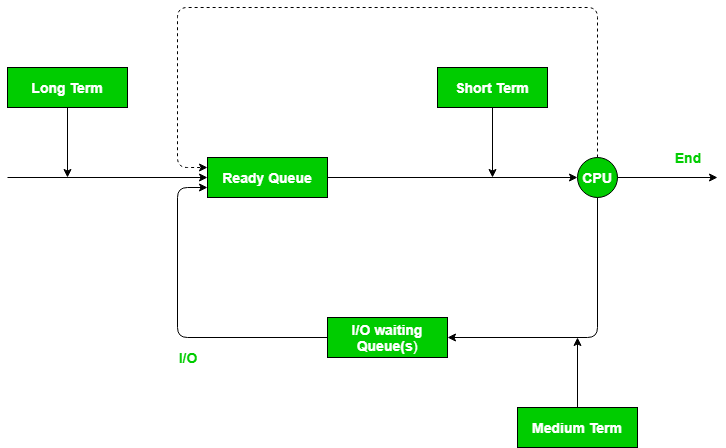 When a process completes its I/O operation then it should again be shifted to ready queue. ALL these decisions are taken by the medium-term scheduler. Medium-term scheduling is a part of swapping. Short term (CPU) scheduler – When there are lots of processes in main memory initially all are present in the ready queue. Among all of the process, a single process is to be selected for execution. This decision is handled by short term scheduler. Let’s have a look at the figure given below. It may make a more clear view for you. Consider a situation, where various process residing in the ready queue and waiting for execution. But CPU can’t execute all the process of ready queue simultaneously, operating system has to choose a particular process on the basis of scheduling algorithm used. So, this procedure of selecting a process among various process is done by scheduler. Now here the task of scheduler completed. Now dispatcher comes into the picture as scheduler have decided a process for execution, it is dispatcher who takes that process from ready queue to the running status, or you can say that providing CPU to that process is the task of the dispatcher. There are 4 processes in ready queue, i.e., P1, P2, P3, P4; They all have arrived at t0, t1, t2, t3 respectively. First in First out scheduling algorithm is used. So, scheduler decided that first of all P1 has came, so this is to be executed first. Now dispatcher takes P1 to the running state. Algorithm: Dispatcher has no specific algorithm for its implementation Scheduler works on various algorithm such as FCFS, SJF, RR etc. Time Taken: The time taken by dispatcher is called dispatch latency. TIme taken by scheduler is usually negligible.Hence we neglect it. Functions: Dispatcher is also responsible for:Context Switching, Switch to user mode, Jumping to proper location when process again restarted The only work of scheduler is selection of processes.